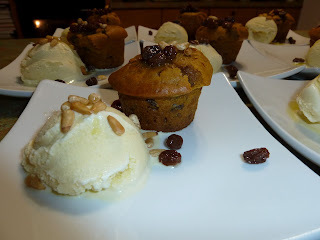 The hardest part about this recipe was explaining to everyone at the table that they were about to eat olive oil gelato. Not that it was hard to persuade them to do it, they just hadn't heard of it and might not have totally believed that there was olive oil in there. Which is funny, because that's pretty much the story in the headnote to the recipe in the book: The same thing happened with the staff and guests at Babbo when this dessert was introduced. But once you taste, it all makes sense. If you use good olive oil. I do. The pumpkin in the cake comes from a can, so that was pretty easy to find. The cake gets a little bit of rosemary, which turns up in a couple of desserts in the book, and is just fine. Plus, the cake is garnished with raisins that are soaked in booze. I diverged from the recipe a little. In the picture, the individual cakes are square. Mine were round. Shrug. Some dishes require a lot of planning, strategizing and shopping. This one didn't. I was at the farmer's market at 14th Street & U, and the first vendor I saw had duck eggs. The second vendor I saw had asparagus. I knew there was a recipe in the book in which those were the two main ingredients. So I bought them and hoped that I could easily acquire the other ingredients to knock this dish out. Here are the other ingredients: Parmigiano-Reggiano cheese. Olive oil. Salt. Pepper. So, I only had to go to my kitchen to acquire the other ingredients. 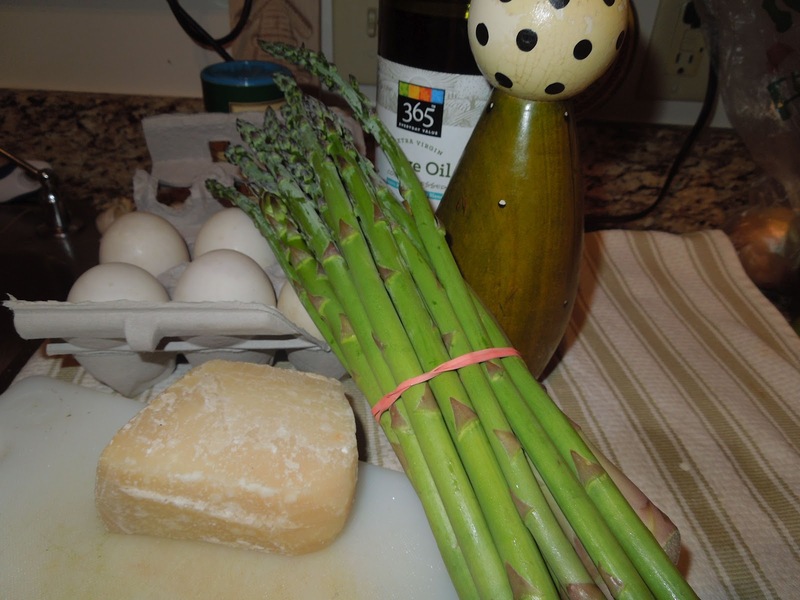 In the picture, it looks like the asparagus are miniature. They weren't. It was part that the egg was big and part that the photo was from a weird angle, I suspect. And the egg sort of looks overcooked. It wasn't. I briefly put the lid on the skillet to encourage the white to set a little. There was just more white covering the yolk than I ever might have imagined. 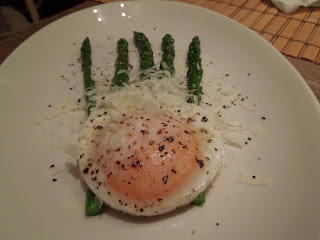 When I broke the yolk, it became a rich sauce for the asparagus. As intended. Maybe I should've done video. 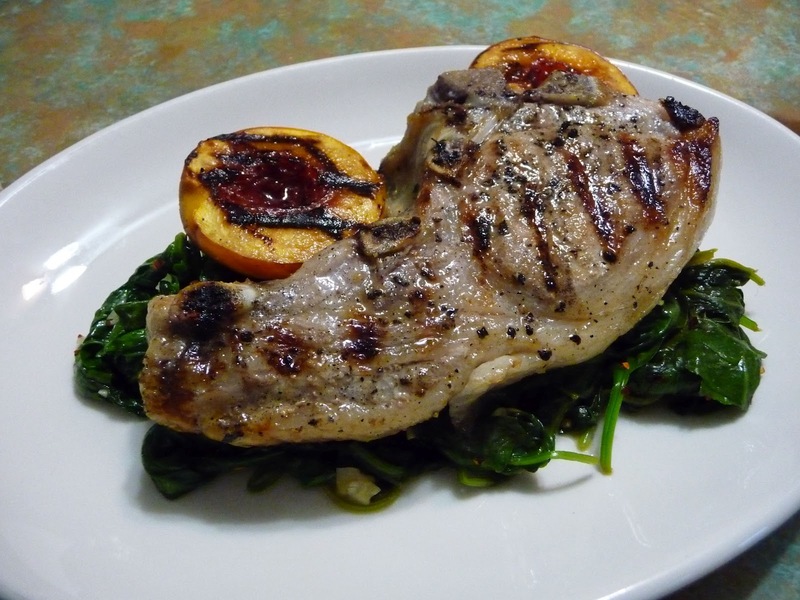 Pork chops. Probably the easiest thing in the book for me to get ahold of and cook, right? So why did I drive two hours -- twice -- to get them? I met the pig first. After dinner at the Refinery in Tampa one night, chef Greg Baker and I were talking about where to get good pork. He told me that they were getting theirs from a small farmer in Brooksville and gave me her name. I wasn't sure exactly what I wanted to buy at that point. 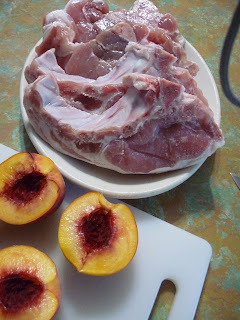 Initially, I thought I'd get all the pork pieces I needed for the book, and maybe a couple other things to play with. But then I started exchanging e-mails with Rebecca Krassnoski of Nature Delivered in Brooksville. She sent me a "cut list," which I didn't really know what to do with. I studied it, and thought that maybe it was like an order form. Turns out, that wasn't what it was. It was more like instructions to the butcher on how to break the animal down. When it came to the "order form," there were only really three choices: 1/4, 1/2 or whole. Meaning, that was how much of a pig you were buying. The rest came down to how it got cut up. So, the process by which the pig went from a pen in Brooksville to my freezer in Clearwater (and the final parts made the trip to Washington and are in my tiny freezer here) will be chronicled elsewhere one day. Suffice to say, I was there for its final moments, and I went back a couple days later when it was broken down and wrapped up for me to take home. For the purposes of this dish, I pulled four thick, pink, gorgeous pork chops out of the freezer. They get brined in a sugar-salt water for several hours and then hit the grill. I like it when a recipe ends up with things hitting the grill. The peaches get grilled briefly, then hit with some balsamic vinegar. Better than applesauce. Notice how the pork chops seem to have tails? That's all in the butchery. What it is is a little chuck of pork belly hanging off the end of the rib. So, basically, there was bacon hanging off the pork chop. They should cut all pork chops that way. The recipe calls for broccoli rabe as a contorni, which I previously made for the osso buco. I made it again, but I also made the scallion barlotta as a contorni. I'm a fan of barley. 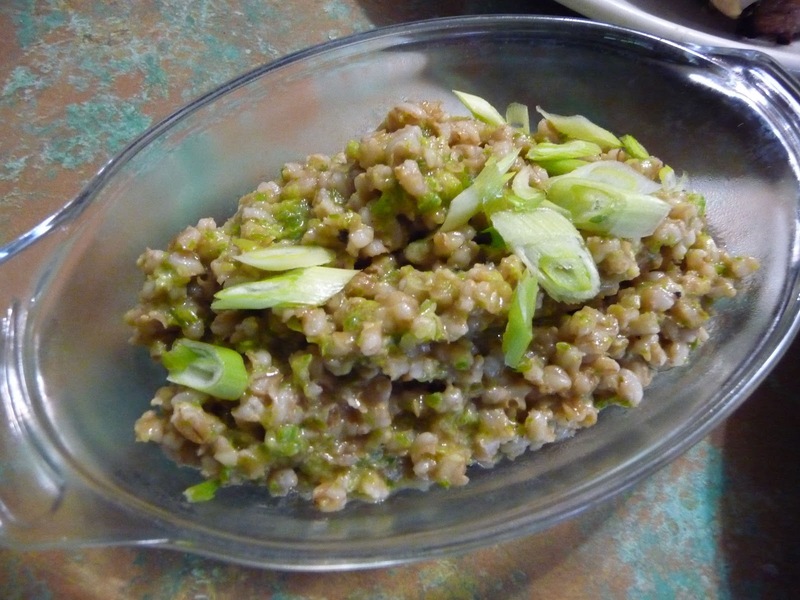 Scallions, however, are pretty much a nice garnish to me, and this was a dish that they starred, so not my favorite. 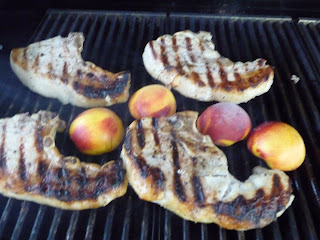 The pork chops were amazing. The texture and the flavor of the meat -- it had flavor -- was like tasting pork for the first time. It made me less interested in ever buying meat at the supermarket again. It was so good, I don't know if it even needed the brining, but it didn't hurt, I'm sure.